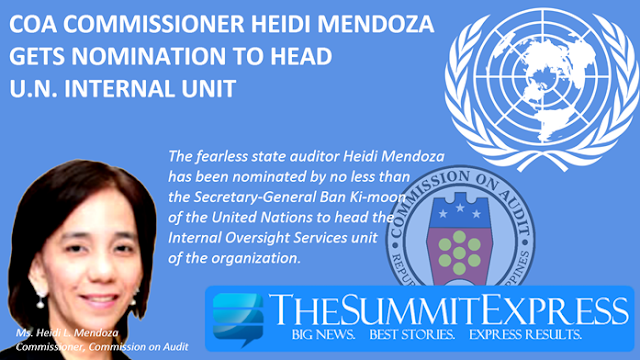 MANILA, Philippines - The fearless state auditor, Commission on Audit Commissioner Heidi Mendoza has been nominated by no less than the Secretary-General Ban Ki-moon of the United Nations to head the Internal Oversight Services unit of U.N. The 52-year old COA Commissioner who has found her life under siege from numerous death threats after exposing the anomalous misuse of funds in the Armed Forces of the Philippines way back in 2011 is set to serve to the internal unit of the United Nations for a five-year non-renewable term once the U.N. General Assembly bestows its formal approval. Mendoza obtained her normal life as a public servant when she was appointed as COA Commissioner by President Benigno Aquino III in 2011. Prior to that, the fearless state auditor faced left-and-right death threats after dragging big names in the AFP for illegally acquiring a 300-million peso military fund by former military comptroller Maj. Gen. Carlos Garcia, the central figure in the biggest corruption scandal that hit the country’s military agency. Former AFP Chief-of-Staff Angelo Reyes who committed suicide during the peak of the scandal was also said to be involved in the alleged misuse of funds in the military. Even the Binays failed to evade Mendoza’s probing eyes as former Makati Mayor Elenita Binay was accused by Mendoza for putting a hand in a 70-million peso worth of medical supplies acquisition project in 2011. Mendoza’s staunch act in promoting her anti-corruption crusade was tested again recently when she stood up to defend COA from a lawyer named Levito Baligod who accused COA of stashing away some 500-million peso from pork barrel funds involving some of their auditors and a commissioner. Commissioner Mendoza caught the attention of U.N. due to her 20-year long excellent track record in public service particularly in the field of audit, investigation, fraud examination, anti-corruption and integrity advocacy according to a report posted in the international agency’s official website.